Late Wednesday MEC Resources Ltd (through the company's investee Advent Energy Ltd through wholly owned subsidiary Asset Energy Pty Ltd) announced the vessel contracted to undertake the 2 dimensional seismic survey of approximately 200 line km planned on offshore Newcastle survey was currently located in an area that has been impacted by Tropical Cyclone Iris and this has delayed the planned survey commencement date of 9 April 2018. The new commencement date will be advised in the coming days as the effects of the cyclone diminish. The survey will be undertaken over the Baleen prospect in PEP11. It is anticipated to take approximately 3-4 days, and will be undertaken at a location predominantly 30km southeast of Newcastle, NSW. A tie line to the New Seaclem-1 exploration well site, approximately 50km northeast of the main survey area, will also be undertaken for geological calibration of survey data. "Following discussion with NOPSEMA, Asset Energy will provide ongoing updates to all stakeholders through a variety of media to ensure an appropriate level of information is available to interested persons and the broader public prior to and during the survey." Goh Hock, chairman of Asset Energy’s parent company MEC Resources, stated. "Operations will commence upon full mobilisation of all necessary personnel and equipment, and pending weather and sea state conditions. Further updates will be provided in due course." The announcement came the same day Merimbula Marina posted a video on its Facebook page of a young humpback whale making its way north. "This morning we were not expecting to see a whale as we headed out for our early morning 4hr Reef Fishing Charter! It was a young humpback and we were lucky to have a few viewings before we headed out for our fishing charter. This is the third whale we have seen in the past few weeks .."
The announcement comes amid criticism by local fishermen in both the local paper, the Newcastle Herald, and an article run by the ABC, both run this week, which points out that April is a peak fishing period for the region. Many local fishermen also state that past seismic testing in the area has wreaked havoc on the local fishlife and that the only time they've pulled up dead fish, through more than four decades of fishing in that area, has been after seismic testing has taken place. Although earlier research on the environmental impact of seismic testing focused on cetaceans, such as whales and dolphins, with case after case highlighting that sonic blasts can cause stress to the mammals and sever communication channels, a June 2017 study by Curtin University and the University of Tasmania shows that the air gun signals, commonly used in marine petroleum exploration, had significant negative impact on the target species (adult and larval zooplankton), caused an increase in mortality from 18 per cent to 40-60 per cent. Newcastle fisho Jason Nunn said in the Newcastle Herald article that the 2D seismic testing was considered less disruptive than the 3D version, which “pulverised” a fertile fishing spot off Port Stephens about decade ago. “When that 3D survey happened out her 10 or 12 years ago, I was out there in the boat fishing at the time and you couldn’t catch a fish in that whole area,” he said. When asked about future plans, MEC Resources spokesman Toby Foster said “3D seismic, airborne geophysics, exploration drilling, water and sediment sampling and many other activities” were options. As pointed out in previous articles, those activities would require NOPSEMA’s approval. In late March Greenpeace Australia Pacific lodged a complaint with the National Offshore Petroleum Safety Authority (NOPSEMA) and Asset Energy objecting to Asset Energy’s approved Baleen 2D HR seismic survey on the grounds it had failed to consult key stakeholders including the whale watching industry and had ignored justifiable requests made by commercial and recreational fishers. “Once again the government is putting oil and gas industry interests ahead of the environment and jobs in industries that rely on a healthy ocean, like fishing and tourism,” Greenpeace Australia Pacific Senior Campaigner, Nathaniel Pelle, said. “The company behind this flawed plan for seismic testing never sought comment from the whale watching industry which operates inside the survey area and knocked back the requests of fishers who’ve been working off this coastline for generations. The seismic testing consists of concentrated blasts of air being detonated every few seconds for days at a time, 24 hours a day, and will take place in an area that is home to at least 22 threatened species, seven of which are endangered and three critically endangered, and crosses over important commercial and recreational fishing spots. Since the testing was approved by NOPSEMA the plan has been criticised by the NSW Resources Minister, Don Harwin, and Newcastle City Council, who voted unanimously to oppose off-shore testing. It's not just what lives in the sea, or migrates through it, or the local fishing industry that will feel the impact of the testing. The whale watching industry, a huge tourism drawcard for the region of Port Stephens north of Newcastle, has also called for Asset Energy's testing to be stopped until more is known about the environmental impact. "We're not raving environmentalists, we've very concerned about it," whale tourism operator and Marine Parks Association chairman Frank Future said. Living Ocean, the Pittwater based organisation who are collating data through their Marine Studies on whale migrations, were among those that pointed out last year the seismic testing was scheduled for during the peak time for the southern migration of humpback whales and their calves. Living Ocean Whale Trax A - The humpback migration tracks in the area that Asset Energy has permission to conduct seismic testing in. Living Ocean Whale Trax B - Barrenjoey headland in bottom left of image. Supplied. A satellite image of PEP11, off the coast of Newcastle, where seismic testing will take place as part of gas exploration. This week the group hosted the film Sonic Sea at Avalon Bowling Club to show locals what may soon be happening off our coasts and may affect not only their enjoyment of fishing off Newcastle and the central coast, but what its affect on what lives in the waters off our shores will be. They are currently fundraising to conduct further Whale Research trips this coming Whale Migration Season. Over the last few years Living Ocean’s data has starkly revealed that areas off Sydney proposed for commercial sand mining and seismic testing are high-use areas for whales and could be stated to be ‘whale highways’ where the mammals are using familiar sea channels and the floor of the sea, as landmarks, to find the way they swim, and have swum, north or south. Living Ocean provides ground breaking whale research data to protect the migration passages off Sydney's northern oceans from seismic testing during the northern and southern migration season. Download their information pack for seismic testing & possible impacts off the Sydney/Newcastle offshore region. The official Whale Migration Season is May to December each year, although, as seen above, whales are already heading north and there are many other sea creatures of water and air that reside permanently here. Soon Pittwater Online will run the 2018 version of the Marine Notice shown below, and that will stay up for the duration. Greens MLC Justin Field said on Wednesday April 4th the delay provided the federal government with an opportunity to quash the testing completely. “The delay … provides a prime opportunity for re-evaluation of this ridiculous plan and for the federal government to revoke Asset Energy’s exploration licence,” Mr Field said. He said the testing was dangerous, the community had expressed concerns about its safety and approval for the survey should never have been granted. “The reality is seismic testing is risky business and threatens marine habitat, productive fishing grounds, migrating whales and the tourism industry that relies on them,”. 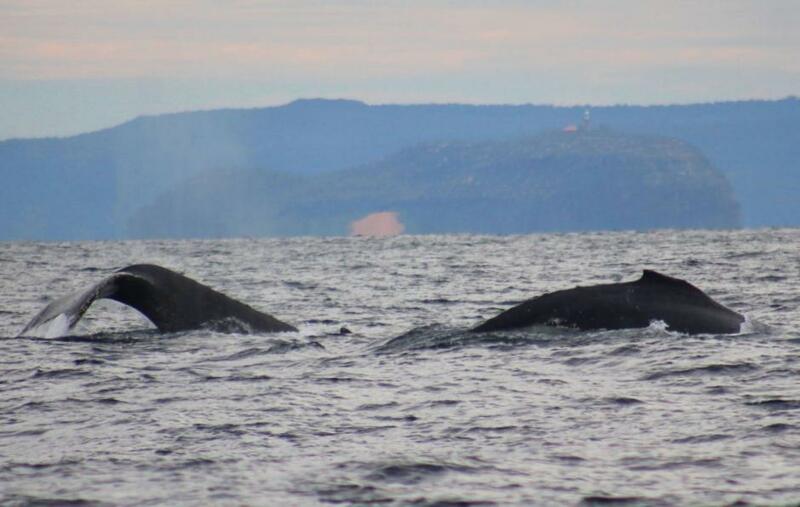 Migrating whales and whale calves are expected to be present in numbers off the NSW coast during this time. From June to August whales will be in greater abundance generally moving north within about five nautical miles (nine kilometres) of the coast. From August to December whales will be in greater abundance generally moving south within about 10-15 nautical miles (18-28 kilometres) of the coast. From July to December Southern Right Whales with calves are likely to be present within 10 nautical miles of the NSW coast and within coastal estuaries. Within this period it is expected that whale sightings may be common and mariners are advised to navigate with due care and appropriate caution around any whale activity, including reducing to an appropriate speed to maintain safe navigation. The approach distance for whales in NSW and Commonwealth waters is 100 metres for whales without calves. If calves are present the approach distance is 300 metres. Charts: AUS 806 to AUS 813 Inclusive. RMS Coastal Boating Maps: 1-14 Inclusive.